Fanatical has teamed up with PC Gamer to gift one of their fans with $1000 worth of Steam games! 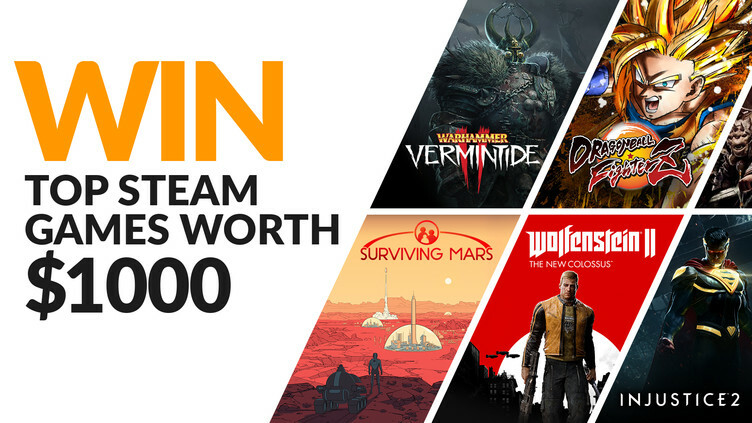 To enter in this 20 Steam PC games Worth $1,000 Giveaway grab your free entries by following few simple steps listed down below! Our 5 heroes have returned to take on an even greater threat – the combined forces of a malevolent and destructive Chaos army and the swarming Skaven horde. Prepare to be challenged like never before as you and your team desperately try to survive the never-ending onslaught. Choose between 15 different careers, climb the talent trees, customize your arsenal to fit your unique play style, fight your way through a myriad of stunning levels, and challenge yourself in our new Heroic Deeds System. The only thing standing between utter defeat and victory is you and your allies. If you fall – so will the Empire. Winner will be contacted by email and has to reply back within specified period to claim the prize! Warhammer: Vermintide 2, Surviving Mars, Dragon Ball FighterZ, Little Nightmares, Rising Storm 2: Vietnam, DOOM, Middle-earth: Shadow of War, Injustice 2, Bayonetta, Grand Theft Auto V, Yooka-Laylee, The Escapists 2, Stellaris, Pillars of Eternity, Tekken 7, Project Cars 2, SUPERHOT, TOTAL WAR: Warhammer II, Sid Meier’s Civilization® VI, Dirt Rally, Ni no Kuni II: Revenant Kingdom, Tales of Berseria, Wolfenstein II and DARK SOULS III!